CD review: "Joe Cool's Blues"
This review first appeared in the April 28, 1995 issue of the North County Blade-Citizen (now North County Times). In his newest book, jazz critic Nat Hentoff asks (only partly rhetorically) "Can Wynton Marsalis learn to laugh?" It's an apt question. The most influential jazz artist of his generation, the young trumpeter has built a body of work that is serious, engaging and, of late, even experimental. But fun? Well, yes, now fun. This collection of music from various "Peanuts" television specials is, like the comic strip that inspired the music, nothing if not fun. It opens with his interpretation of Vince Guaraldi's "Linus and Lucy"  better known as the "Peanuts" theme song  and then his since-disbanded septet and his father's trio alternate tracks. 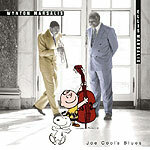 Ellis Marsalis' trio reprises other Guaraldi material from the "Peanuts" specials, while the septet presents songs Wynton wrote for a recent "Peanuts" special. Wynton and Ellis do not play together on this set, although Wynton's brothers Branford (saxophone) and Delfeayo (trombone, and also producer of the album) sit in with Ellis' trio on "Little Birdie." Wynton's compositions balance Guaraldi's well. "Wright Brothers Rag" is a throwback period piece recalling the era when the Dayton duo were first conquering heavier-than-air flight  Victor Goines' clarinet gives it an early jazz sound that adds to the feel. The piano's bass lines on the intro to "On Peanuts Playground" draw heavily from Guaraldi's style, while setting up one of Wynton's typical explorations of the melody. Both combos, of course, are at the tops of the profession. Wynton's septet  including pianist Eric Reed, saxophonist Wessell Anderson and drummer Herlin Riley  was among the top handful of jazz bands in the world when it was disbanded a few months ago. Brilliant soloists all, Wynton had also molded them into a fine ensemble as well. Ellis' trio (with himself on piano, Reginald Veal on bass and Martin Butler on drums) swings more than Wynton's group on this outing, even though its arrangements are slower, more low-key. Ellis' piano captures the warmth of Guaraldi's compositions (Guaraldi was also a pianist), and he remains a very original soloist. Whether Guaraldi's time-worn favorites or Wynton's songs written for more recent Peanuts specials, most of the songs here positively bounce. And, yes, to answer the question: Wynton Marsalis has learned to laugh, especially in his music.